Guitar sizes vary. There are dinky little guitarleles and enormous jumbo acoustics. In this guide, we’ll take you through them all from smallest to biggest. The ukulele is a small Hawaiian guitar with four strings. It’s the smallest guitar you’re likely to encounter. Ukes are ideal for people who find normal guitars a bit too big eg. small children, adults with tiny fingers or people who just love the sound of a uke and/or don’t fancy carrying anything too big and heavy around. Ukes produce a very trebly sound with pretty much no low end at all. They’re also tuned differently to normal guitars, which means they’re not ideal for beginners who intend to ‘graduate’ to a full sized guitar in the future. A guitarlele (also sometimes called a kiku) looks a bit like a ukulele at first glance, but it’s slightly bigger and has six strings. This is one of the smallest guitar sizes of all. It combines the portability of a uke with the versatility of an ordinary guitar, so it’s ideal if you desire the best of both worlds and are worried about guitar sizes due to portability/transport issues. You can use the same chord shapes on a guitarlele as you would on an ordinary guitar. This is a huge plus and why we always recommend guitarleles over ukuleles. Guitarleles are tuned higher than guitars. Their key is the same as a standard guitar’s would be with a capo on the 5th fret. This can cause a bit of confusion if you’re a guitarlele player looking to play along with a normal guitar. Like the uke, guitarleles are very trebly. They have a a very similar tone. Are you a beginner looking to buy a guitar? 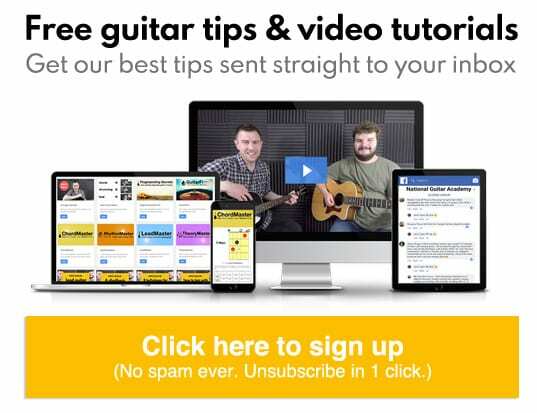 Check out our article: What’s The Best Beginner Guitar? The half-size guitar, as it’s name would suggest, is half the size of a standard guitar! Of all the guitar sizes, this is the most popular with young children who will struggle with an adult-sized guitar. 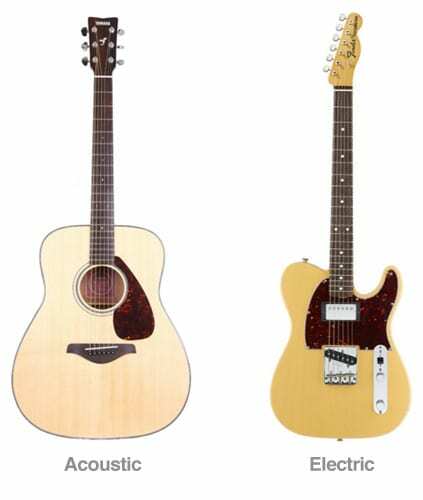 Both electric and acoustic guitars are available in half-size. Unlike the guitarlele, a half-size guitar will tune into concert pitch (standard guitar tuning). Half-size guitars are ideal for smaller children, but as they grow older and bigger, they’ll need a bigger guitar. The three quarter-size is the next size up and of all the guitar sizes this is best for 8-12 year olds. Don’t think this is kids-only, these guitars are perfect for petite adults too. Much like the half-size, both electric and acoustic guitars are available in three quarter-size. While both the electric and acoustic three-quarter size guitars will be the same length, the body of an electric guitar will be thinner as, being an electric, it doesn’t need a big hollow body for sound to bounce around in. The parlour guitar is the smallest of the full-size guitars. This is ideal for the guitarist looking to make the transition from three quarter-size to full-size. Parlour guitars are perfect for people who find Jumbos and Dreadnoughts a bit too bulky and awkward. In our experience, most women love parlour sized guitars. They sit low on the knee, have a lovely tone, and are very accessible and playable guitars. Of the guitar sizes, this type has a mid-range-rich sound rather than the boomy bass-rich sound of a jumbo or the trebly sound of a smaller guitar. Auditorium guitars are big like Dreadnoughts, but a bit curvier and thinner, so can be a bit easier to sit with. We’re getting into larger guitar sizes now. These have quite a deep, bassy sound due to the bulky end of the body while still sitting fairly comfortably on your knee thanks to the extra curviness. These are ideal for people who want a big sound without necessarily being big people! A Dreadnought, as its name would suggest is a big guitar that makes a big sound. This is the most ‘classic’ of the guitar sizes here. The large bulky body allows for a lot of sound to bounce around inside it meaning we get plenty of low end. If you don’t mind all that bulk in the body and you like the idea of the big sound that comes with it, then a Dreadnought might just be the guitar for you. Obviously though, the Dreadnought is not so suited to smaller people, or people who want a more mid or treble-rich sound. 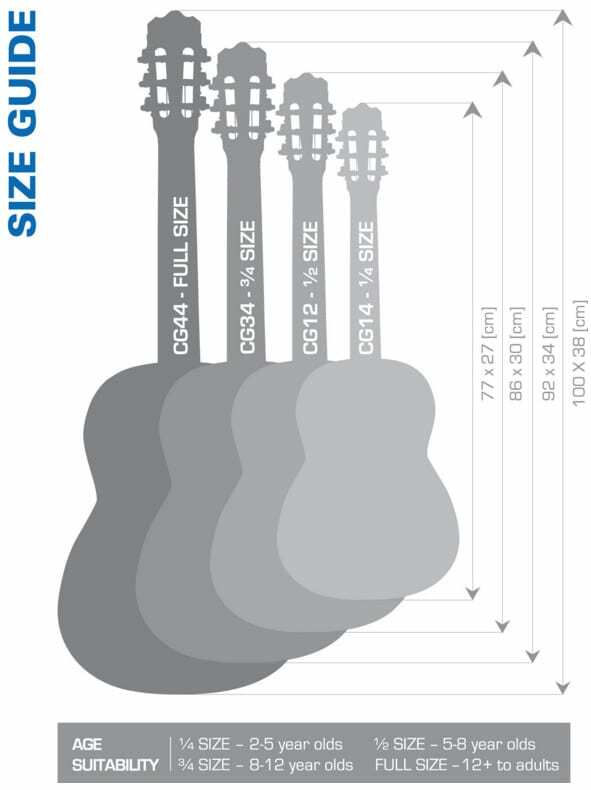 Guitar sizes – As big as a plane? Nearly! It’s Jumbo time. The Jumbo is another big guitar that makes a big sound. This is the largest of all acoustic guitar sizes and jumbos have a large warm tone. A big guitar generally means a big sound, but also a big bulky thing to carry around and wear/hold while playing. Bigger people tend to suit bigger guitars, though that’s not a hard & fast rule. As ever, you need to TRY a guitar before buying it. Sometimes the allure of that big sound is enough to convince a smaller guitarist to put up with the bulkiness of a big guitar like a Jumbo. There are lots of different electric guitars on the market, however, their guitar sizes don’t tend to vary much beyond half-size, three-quarter-size and full-size. That’s mainly because an electric guitar doesn’t get its sound from a hollowed out body, rather it has a solid body and electronic pick-ups and gets its sound from an amplifier. As such, we don’t really have electric equivalents of the Parlour, the Auditorium, the Dreadnought or the Jumbo, rather we just have full-size electric guitars. As mentioned earlier, electric guitars generally have thinner bodies, so a full-size electric, while being the same length as a full-size acoustic will still be smaller bodied. It’s important to note though, that while electric guitars tend to be more compact, they’re also a lot heavier! They’re made of solid, often very-dense wood. Although we’re mainly looking at guitar sizes here, it’s worth having a quick look at bass guitar sizes. The most famous bass guitar is probably the Fender Precision and it’s quite a big, sturdy instrument. There are smaller bass guitar sizes though. Paul McCartney was famous for playing a Hofner Violin bass which had quite a small, roundish body. As with regular guitars, bass guitars are available in half, three quarter and full-size. There’s even a ukulele version of the bass!